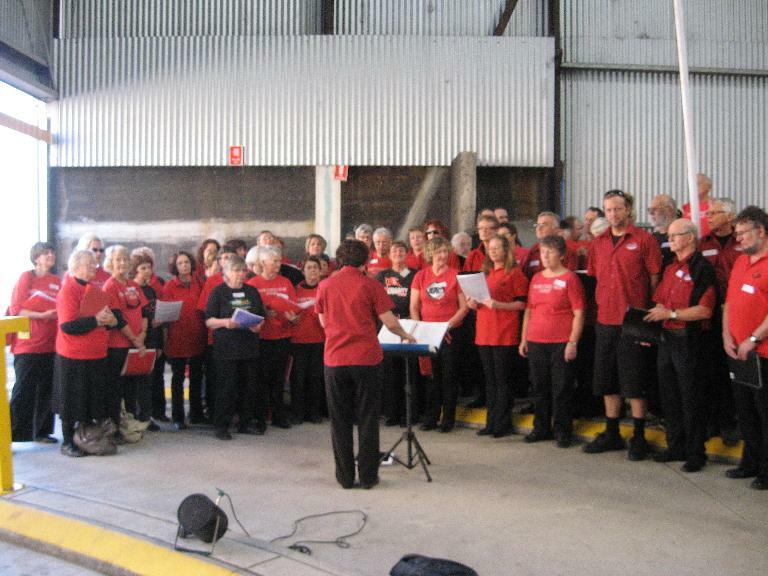 Members of the Newcastle People's chorus travelled to Sydney on Saturday 21 May to join with other union choirs for a day and evening of singing and fun. Our venue, the Redfern Community Centre, was really easy to get to by train or car. It is located in Hugo Street and it has many facilities for groups, large and small. The performance space we used has a fully-sprung dance floor with a kitchen available for use as well. The day brought together members from the Newcastle People's Chorus (NPC), Sydney Trade Union Choir (STUC), Brisbane Combined Unions' Choir (BCUC), Canberra Union Voices, Illawarra Union Singers and Victorian Trade Union Choir . The network of union choirs is extremely strong in Australia and it was great to see the familiar faces once more. At 10am we started with an hour of voice coaching by Sarah Penicke-Smith, Musical Director of the Sydney Gay and Lesbian Choir. We really found various parts of our anatomy that we didn't realise affected our singing. Some of the sounds were quite unusual and our conductor, Gabrielle Thacker has continued to use a number of the exercises we were taught. After an hour of coaching, it was down to some serious singing with Musical Directors Gabrielle Thacker from NPC, and Marina Thacker from BCUC taking the combined group through a number of common songs before our first performance. 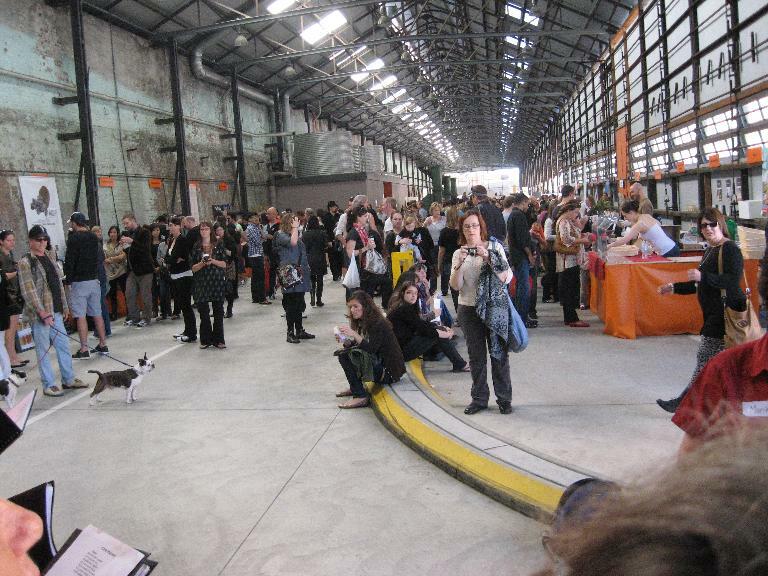 After this short rehearsal, we walked to the Eveleigh Markets to savour the aromas and atmosphere before performing. NPC performed two songs by ourselves which were an absolute hit, especially the Mean Call Centre Blues. This is sung with backing from the guitar played by Gabrielle, and it really rocks. The combined performance of over 60 voices resounded throughout the shed and we attracted a strong crowd. Our voices added to the atmosphere of the markets, especially with the children who were drawn to our melodies. After a break for lunch, we wandered back to the Redfern Community Centre for a final rehearsal of more common songs as well as a rehearsal with BCUC to prepare for the concert at the Cauliflower Hotel in Waterloo (the one with the big cauliflower on its roof). Celebrations at the Cauliflower hotel started at about 4pm where each choir sang a few songs. We also had a combined choirs set with common songs. 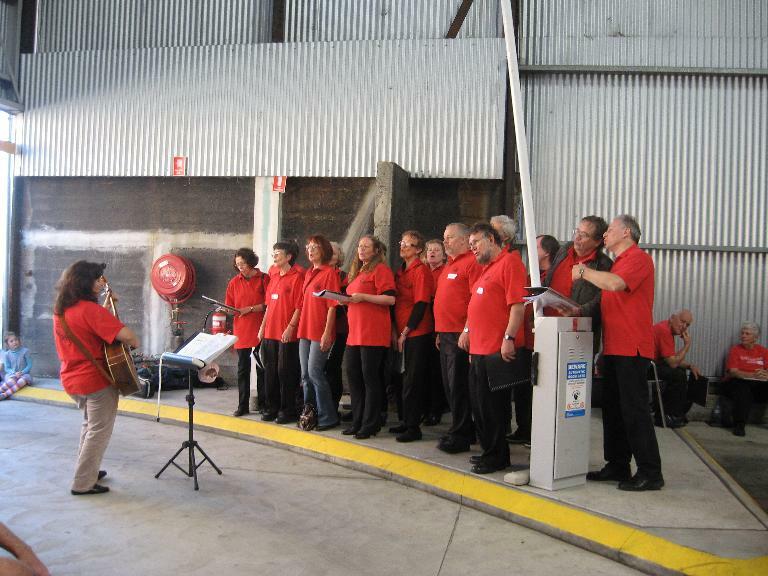 The main reason for the get together was to celebrate the 20th anniversary of the Sydney Trade Union Choir, hence a combined performance of Happy Birthday was belted out by members from Newcastle and Brisbane. The Cauliflower is a unique pub and about 70 people fitted into the small bar area, all seated for dinner. The meals were delicious and very affordable. There were a few speeches, and the one from our member Rod Noble follows. Rod was a founding member of the NPC and has had a long association with STUC so it was fitting that he speak. We all had a great time and it is a wonderful feeling when so many people come together to sing songs that have so much meaning. NPC look forward to the next time that the choirs will get together. 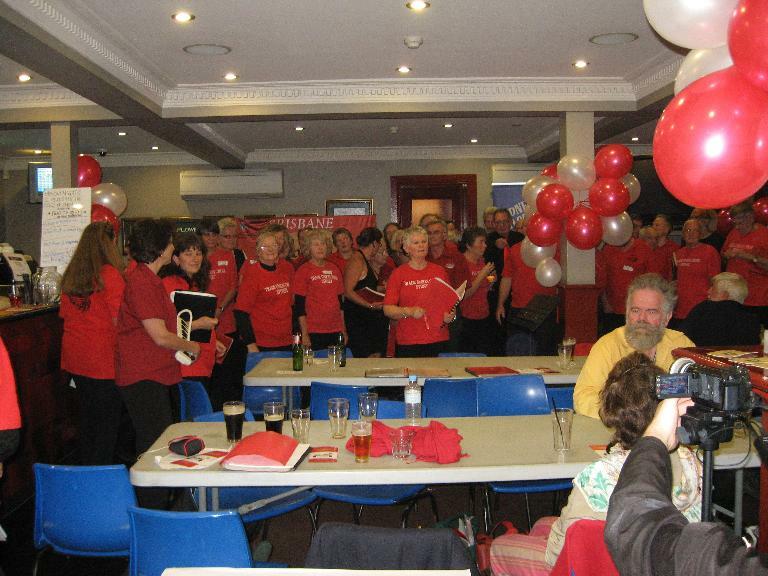 Happy 20th Birthday Sydney Trade Union Choir (STUC) from Rod Noble, 21st May 2011. Thank you for the honour of wishing STUC a happy 20th birthday and many happy returns. To me the fact of STUC turning 20 has an importance far beyond celebrating a milestone. One directly related development of significance and a reason why the mere existence of choir like STUC is important [as well as the fact that it has been going for 20 years] is the challenge posed by the social, economic and industrial changes over the past few decades. Things like, the decline of union density, the decline of the collective spirit, the rise and worship of the individual, and not accidently, the rise of neo-liberalism. [Let's not forget the latter's arrogant [and incorrect] assertion that we are witnessing the "end of history"]. The 20th birthday of STUC is, in a sense, a testament to the importance attached to preserving a different view of the world and to how society changes. In the 1980s and 1990s [and before], the crisis that appeared in social democracy was clearly evident to many people on the Left of politics. Some current commentators are revelling in this new discovery but they are 20-30 years behind the times. What a number of union activists and left wing people had the foresight to do when faced with this crisis some decades ago was to materialise and preserve important aspects of this other world view - with its powerful culture - and to make sure it was able to be kept alive and shared into the future. The people behind the formation of STUC were part of this, as were those that have joined the project since. The working class at one point almost had the sense of being a class in itself and for itself. It had developed its own culture albeit in a rather thin layer. There were the stories, the histories, the songs, the humour and the poems. STUC is a crucial part of a movement to, not only keep this world view alive, but to keep renewing it and developing it. Today what you see amongst us are the warriors of the not so secret knowledge that is preserved and translated to a new generation and which in turn becomes an attack weapon against defeatism and despondency and for the struggle for improvement and a better more caring and sharing society. STUC, among other things represents, a force which when let loose opens links directly to the collective conscious of the class it is part of. It is recognition that it is their experience, their past, their future. Therefore in celebrating STUC's 20th anniversary, we celebrate this and also the primacy of the collective not only in the content of the stories that the songs portray, and of how people together can overcome enormous odds, but in the collective nature of the presentation itself. STUC and the other union choirs are involved in a very important historical task. What the mass media fails to do, and militates against, in regard to representing our struggles past and present, we can and do translate to others. Some might see this as a great weight and responsibility to have upon one's shoulders, and to a degree it is, but in fact, as we all know, it is the greatest pleasure to be able to do this - after 10 years, 20 years or 50 years. Happy birthday Sydney Trade Union Choir.